Worms are pretty gross, and no one wants their pet to become infected. Fortunately, protecting your pet and your family is easier than ever, with vet-strength wormers available via the pet shop. It is recommended that you worm your pet at least every three months – that’s one treatment for every season. By committing and sticking to a regular worming routine, you too can become a seasoned wormer, and help reduce the risk of both your pet and your family becoming infected by worms. But how much do you really know about worms? Read on to find out more. Worms are parasites which need a host in order to complete their lifecycle, such as your cat or dog. Worm eggs can lay dormant in the environment for months, and can become attached to our pets’ fur, paws or noses when outside. These eggs are then ingested while grooming, at which point the worms begin their lifecycle. The most common types of parasitic worms that infect our pets belong to a scientific group of primitive animals called ‘helminths’. How many types of worm are there? Although simple in structure, parasitic worms have been on earth of millions of years. During this time they have evolved into thousands of different species, and adapted to live in many strange places, including inside our pets. It is impossible to name every single type of worm, but there are a few types that you should be aware of. What are the main types of worms I need to be aware of? Tapeworms are one of the most common types of worm to afflict cats and dogs in the UK. Classic tapeworms (the Taenia species) are flat worms resembling a string of segments all linked together. In order to complete their lifecycle tapeworms need an intermediate host. For a Taenia tapeworm, this may be a mouse or a rabbit, and for Diplydium caninum it’s usually a flea. Your pet becomes infected when it ingests the infected intermediate host; this could occur during grooming, or after hunting and eating prey. While the host is digested, the tapeworm produces anti-enzymes to protect itself, and the larvae is released. It will then travel to the intestines and hook onto the gut wall. Here, it will continue to mature until it reaches adulthood, at which point it will release an egg-filled segment resembling a grain of rice. Owners may spot these in their pet’s faeces. Once dried out, the segment will burst open, releasing the eggs into the environment and the whole process starts again. 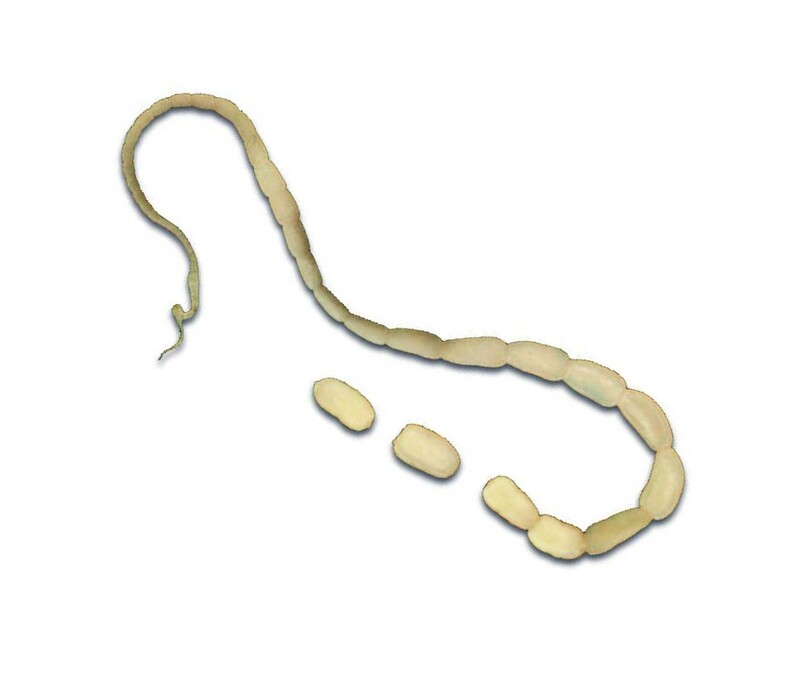 These spaghetti like worms live in your pet’s intestines, feeding off the contents and can grow up to 100mm in length. Roundworm eggs are particularly sticky - often sticking to paws and noses - are then ingested while grooming. They are also extremely small, so you are unlikely to see them on your pet. Roundworms behave differently in kittens and puppies to how they do in adult cats and dogs. In both cases, the roundworm larvae will be ingested and hatch out in the stomach. They will then burrow through the gut wall into the bloodstream. In a kitten or puppy, once the larvae reaches the lungs it burrows into the airsac, and continues to the wind pipe. As the worm crawls up the windpipe, it irritates the throat causing the kitten or puppy to cough up the worm larvae and swallow them back into the stomach. Here, the worms continue maturing into adults, where they lay more eggs which are released into the environment via your pet’s faeces. In an adult pet, who have generally developed a better immune response, once roundworms are in the bloodstream the larvae are diverted to the muscles where they form harmless cysts. These cysts can lay dormant for years, only recommencing their journey back to the intestines when the immune system is compromised, usually due to old age, illness or pregnancy. Roundworms are the most common type of worm that can be transmitted to humans. Fortunately, so long as you’re careful to dispose of faeces quickly and safely, and wash your hands after doing so, and you can minimise the risk. What other worms should I be aware of? 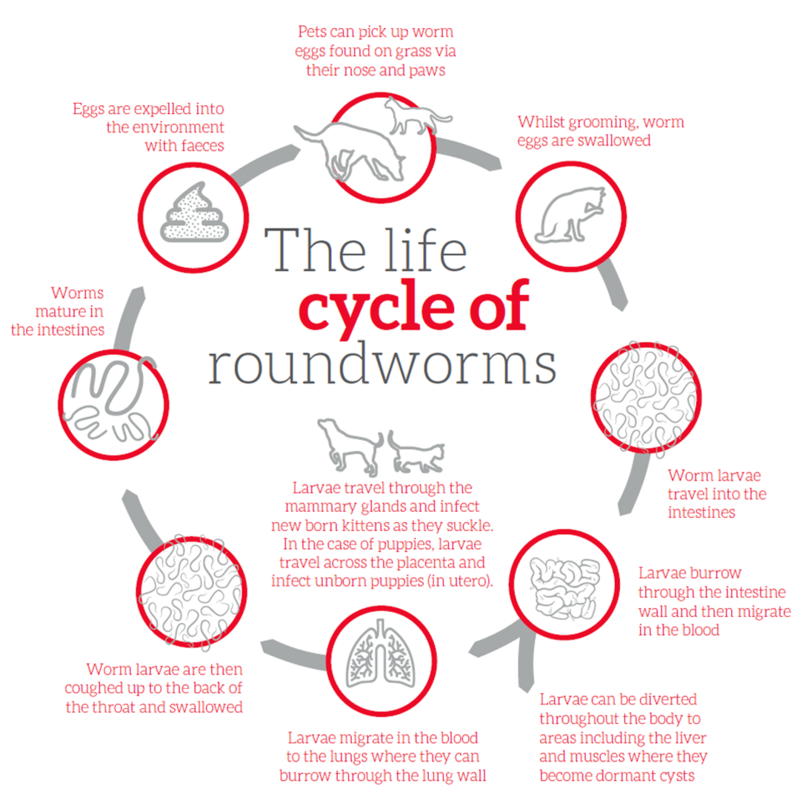 Lungworms generally prefer a warmer climate, and so are uncommon in the UK. However, the number of incidences has spread across several areas of the UK in recent years, so it is worth pet-owners becoming more aware. Lungworms most commonly affect dogs, who become infected when they eat infected slugs or snails. Lungworms live in the blood vessels supplying the lungs, and symptoms include respiratory problems and coughing. As a precaution, you may wish to make sure you regularly clean any water or food bowls and toys that get left outside, as worm larvae can be found in slime trails. Although uncommon in the UK, hookworms can cause serious health problems for your pet. They are a small worm, usually growing to between 5 and 16mm in length, with adults living in the intestines and feeding off your pet’s blood. This can cause anaemia and damage to gut wall. In cats, hookworms are picked up by ingesting larvae in the environment. Studies have estimated that 7 out of 10 UK foxes carry hookworm, which increases the spread and risk of dogs becoming infected. Occasionally, a cat or dog may be infected by larvae penetrating the skin (usually through the feet). Hookworms are hard to spot, but some symptoms include blood in the faeces or diarrhoea, lesions on the feet if hookworms have entered through the skin, and poor appetite. Although not present in the UK, if your pet travels abroad they could be at risk. The disease is transmitted by mosquitos, and symptoms include coughing, loss of condition and collapse. If you’re travelling abroad with your pet, be sure to visit your vet before you travel to discuss preventative treatment. Threadlike in appearance with a thick head, whipworms grow from 50 to 76mm long. They live in the last part of the small intestine and the first part of the large intestine. The female can go for long periods of time without laying eggs, which can make them difficult to diagnose. Whipworm are rare in the UK, but if you’re travelling abroad you should seek advice from your vet about preventative treatment. Worm Awareness Week 2018 is running from 26th May – 3rd June 2018. Become a Seasoned Wormer and stock up on Beaphar WORMclear®, and you too can win against worms. Visit www.wormawareness.com for more information.